The Ancient Egyptians valued health and beauty and created all sorts of concoctions in response to the dry sandy winds and hot sun. Elixers, ungents, oils and salves were brewed, blended, extracted and conjured up by royalty and slave alike. Now Maia Skin Care has drawn inspiration from the Ancient Egyptians to produce a truly magical hydrating mist and toner. Egyptian Rose Hydrating Mist captures the essence of opulent trailing roses, sweet fresh geraniums with a hint of warm seductive vanilla. It is created by harmoniously blending organic rose petal and geranium waters, vegetable glycerin and pure plant extracts of hibiscus, oats and frankincense to tone, soothe, nourish and hydrate the skin whilst instantly calming the mind. The Egyptian Rose Hydrating Mist is multi-functional and suits all skin types and skin conditions. It is so useful you will want one for your desk, in your drawer, make-up bag, locker and everywhere you go! Just a few amazing benefits: hydrating, balancing, toning, helps refine pores, helps other products work better, calms irritated skin, soothes sunburn, can be used as a moisturiser for oily skin, treat razor burn and more. 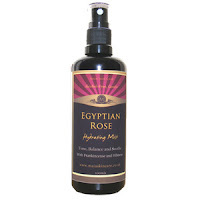 You can get the Egyptian Rose Hydrating Mist 100mls now for the introductory price of £13.57. It is packaged in a beautiful dark glass bottle, so stylish and elegant! This special offer is available until the end of June 2009 and the usual price will be £16.95. Read more about the wonderful benefits and uses on the Maia Skin Care website www.maiaskincare.co.uk and sign up to the Maia newsletter while you are there for a 15% discount and regular exclusive offers, news and freebies. This is a most indulgent product. A must-have for hot days to refresh and revive both the skin and the soul. I have been using this gorgeous spray practically constantly. I have used it as a toning spritzt right after cleansing as it rehydrates and the moisturisers seals it in. I have also been using it throughout the day, over make up, as it really cools and refreshes. The aroma is exotic and luscious and it really brings comfort to the skin. Just lovely. Fantastic to use when you have a headache (on the face and the back of the neck) as it seems to bring some very welcome relief. Beautifully packaged, really classy and stylish and I have really enjoyed showing off to just about everyone who happens to be in spraying distance - they don't complain, in fact it most often gets grabbed from my hands so they can get a closer look. It is so clearly labelled, beautifully presented and a generous volume (should keep me going for a little while yet). I for one can't wait to see what else comes out of the the Maia Skin Care lab because it just keeps getting better and better and better. This new addition is a must have for the summer!! I love body mists, especially in the summer. Nice. Love this. I love a good moisturizing mist after the shower. Here in New Mexico it is so dry that a body mist is just the thing. This was a lifesaver during a recent heatwave (not often a term associated with the UK, lol) but it was wonderful to just bring some instant cool relief.